Many real world limitations don’t exist in Second Life. For this reason, the Second Life users have the freedom to behave differently than in the real world, satisfy different needs (for example, the need to have fantasy outfits) and literally take the world into their own hands. Therefore it should come as no surprise that many established real world business and marketing models simply don’t work in SL. Real companies entering Second Life must get to know the virtual world and prove their value to the users. 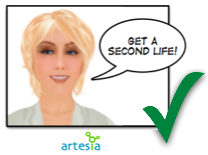 Second Life = the world wide web. Second Life residents are not in SL to receive the same kind of content in 3D as they could on the web. They are there for new experiences, not links to web sites. There is nothing worse for Second Life users than clicking an advertisement and being moved out of Second Life into a new browser window. Established web privacy/value trade-offs (for example, letting a company know your e-mail in exchange for a discount) must be re-evaluated and set based on specific usage. Yes, we do have money trees in Second Life, but don’t expect to get rich in SL with no effort. To make money, an individual or a company must be even more innovative and adaptable than in real world because of larger competition and a level playing field. Success requires time and effort. And don’t get in SL just with the vision of making money. Get in, enjoy the ride, and be inspired by what other are doing. Nobody has a Second LIfe crystal ball, which can tell us SL best practices and future developments of virtual worlds. You can’t even guarantee that Second Life will work when you’ve got an important demo scheduled! It is important to remember that virtual worlds are still in early development stages - think of the state of the world wide web in 1995. Don’t trust people that claim they’ve got all the answers, and check the figures; Second Life doesn’t have 10 million unique users! And just as we’re all still finding our way around Second Life, nobody can predict for sure what virtual worlds will look like in 5 or even 10 years. Could anybody predict BitTorrent, Facebook, YouTube or Flickr in the Mosaic age? After the initial stages of experimentation, Second Life and virtual worlds will likely become a new way of communicating with colleagues, business partners, customers, friends and family and enable us a new way not only of doing business, but of living - just like mobile phones and the web have done in the past. Forward-looking companies/institutions and individuals that start learning about virtual worlds now will have an advantage in future. As I always say: there is no better way to understand a new technology than by trying it yourself. And I’d also suggest you to try different usages of Second Life. I might be spending a lot of time in Second Life for business/networking purposes, but I still find time for fun explorations with friends. Second Life: What Do We Learn If We Digitize EVERYTHING? And what are in your experience the most common myths and misconceptions you have to deal with when talking about Second Life?